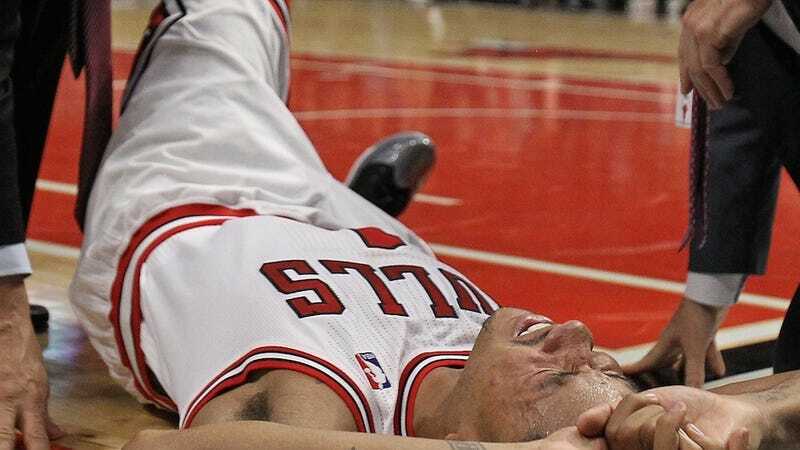 Did Derrick Rose's Shoes Cause His Knee Injury? Today, Chicago froths at a Nike shoe designer, Jason Petrie, who tweeted on Saturday that Derrick Rose should have signed with Nike, like LeBron did. LeBron, wrote Petrie, was only getting stronger, while Rose, thanks to his high-top adiZero Rose 2.5's, was toast, with a torn ACL. Is there any reason to blame Rose's shoes, though? The short answer: no. The shoe determinist's logic makes a crude kind of sense, sure. If the shoes give Rose no range of motion in his ankle, then the knee becomes the active joint down there. Land wrong, and the knee pays the price. Kareem Abdul-Jabbar forswore high-tops for that reason. But science says otherwise. A 2012 Australian concern (investigating netball players!) reported that high-tops do limit the range of motion in the ankle but cause no observable change in knee motion. Tim McGuine, a Ph.D. at the University of Wisconsin-Madison told the Lower Extremity Review that his ongoing study saw no difference in the incidence of knee injuries between players who wore ankle braces—high-tops taken to the extreme—and those who didn't. No study that I could find attributes ACL injuries directly to decreased mobility in the ankle or the foot. In fact, the most convincing explanation of ACL tears comes from a 2008 article in the Journal of Athletic Training, which argues that non-contact ACL injuries result from excessive quadriceps force and sudden acceleration and deceleration and not transferred stress from the ankle. Those who would blame the condensed NBA season for Rose's injury are mistaken, too: renowned orthopedic surgeon David Altchek told the AP that there is no correlation between wear and tear and ACL injuries. Rose landed wrong. It happens, in Adidases and in Nikes.